I'm trying to have a play around with the MAF sensor by modifying the signal the the ECU receives, but I can't quite figure out the pin out. There is nothing in the haynes manual about it. I think it should have a 2nd ground for the chassis and ECU. 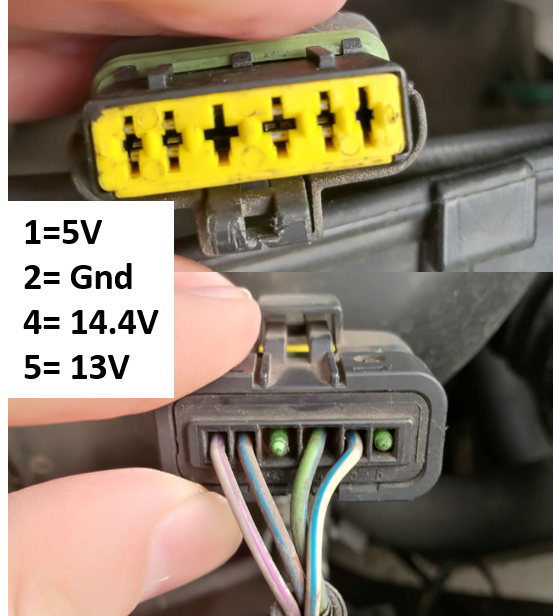 Anyone know why pin 4 is 14.4V? 4 is the ignition feed - 14.4v is alternator charging voltage so that's fine. The IAT is separate on this engine hence the empty pins. Shouldn't the MAF signal be from 0 to 5V though?